I received a letter of invitation one morning from the dean of College of Arts and Sciences of University of San Jose Recoletos in Cebu. 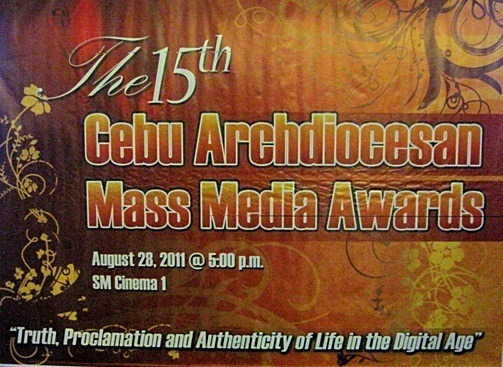 They asked if I was available on a Sunday for the Cebu Archdiocesan Mass Media Awards 2011. It turns out that this site: soloflightEd.com, has been chosen as a Finalist in the CAMMA 2011. The award-giving body recognizes content that’s been shared by different forms of media: whether it be in television, radio, newspaper, advertising or online. CAMMA aims to recognize “local media practitioners across all media platforms” who help promote Christian values. The awards will be given in six categories: website, advertising, radio, television, Cebuano newspaper and English newspaper. I’m not really sure of the criteria for judging the winner but I’m thankful to have been included. To think I was just looking for other opportunities to travel outside and plan what I’m going to do during the first quarter of next year. Then this news came up unexpectedly. Vernon Go won the award for the Website Category. Not really sure why I’m included in this roster as my site is not really focused on Cebu as a whole. I write articles that deal more on narratives about my travels around the country and beyond. But the special mention was really great; it showed that I’m on the right track in producing quality content in my blog write-ups. Apart from that, representatives from different media forms were present which added more prestige to the event. In the end, Vernon won the award and I congratulate him. It just shows that when we love what we’re doing, we will excel with our passion! Naks! Pang Mass Media na o! Pati yung couch naka-link! Tambling! Hahaha. Congratz!. Being a nominee palang panalo na yan. tsk tsk tsk!!! LEVELING!!! Congrats man! @Ron: leveling talaga? may Values pala ako. lol. thanks ron! yep! being a nominee is already considered an honor. clap clap clap! at talagang sapul na sapul ka ng spotlight e no. hahah! sa susunod ikaw naman ang ma-awardan malay mo. start na yan. Wow, way to go! It's quite an accomplishment to a finalist in a competition like this. You deserve it. Will be judging the next CAMMA. See your works there. Congrats edcel! See… your blogsite is one of the best. Keep up the good work! Hope to visit Cebu soon! Congratulations too Ed! 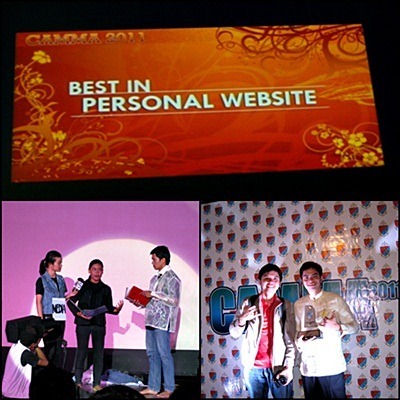 Thanks once again for the pictures..hehehe..I agree, it was a bit weird..but I guess we fit the theme though, :D..being a church based award giving organization, it's as if the Church reads my blog @_@ (Scary ahahahah)..Salamat din sa mga nag congratulate dito 😛 Happy Blogging! @jeffz: lol intrigero. hehe. thanks jeff! @gregg: wow, if I'll get nominated again. thanks for dropping by Gregg! @vernon: haha congrats again iggy! nyaahh… dili uy! lol. josh n tga-gensan. Btw, I'm shocked to know you haven't tried masareal! I thought it's a common delicacy there. Try Mana Acion's masareal from Shamrock. I'd treat you for your bday but since I'm not there, pretend it's my treat na lang, hahaha! @OLAN: ikaw jud ako idol kay tungod sa MERELL. hehe. thanks. @supertikoy: haha, ok lang yan. thanks jerome! @eric: yeah, swertehan. hehe thanks! Congratulations for bagging a nomination for that category, Ed. I'm proud for being one of your subscribers.